A new two-storey passenger terminal, which will be big enough to handle up to 700,000 passengers a year, will open at Seletar Airport at the end of 2018. The total capacity is more than 26 times the number of passengers that the airport, which now caters mainly to private jets, handled last year. When the new terminal opens, Changi Airport's turboprop traffic, which now numbers up to 20 flights a day, will move to Seletar. About 400,000 passengers a year are expected to move as well. 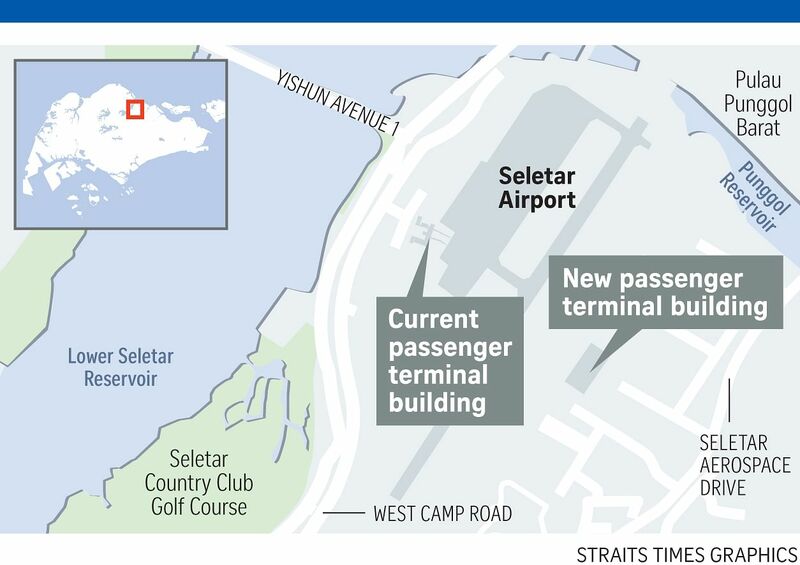 • The new terminal at Seletar Airport will be 9,500 sq m compared with 2,000 sq m now. • It will have four check-in counters, four immigration counters and two security screening stations for passengers on scheduled commercial flights - more than double the current facilities. • Passengers on business and private jets will have their own area with dedicated check-in and other facilities. They will also have access to a private drop-off area. • Instead of being driven to and from aircraft, passengers will be able to board their flights more directly with three aircraft parking stands adjacent to the terminal. • There will be 145 carpark spaces, instead of 25 now. This will free up capacity at Changi Airport - which handled 55.4 million passengers last year - to cope with a growing number of flights and passengers, Changi Airport Group spokesman Ivan Tan said at the ground-breaking for the new Seletar facility yesterday. Smaller planes like turboprops need a greater separation distance than normal from other aircraft when taking off or landing, to ensure that the turbulence from a bigger plane does not pose a safety risk to the smaller aircraft. This, however, means that fewer flights can be handled at any given time, which is inefficient for a hub airport like Changi that wants to grow its traffic. The 34-year-old passenger terminal at Seletar Airport will be demolished when the new facility opens. At the new terminal, private jet passengers will have a separate area with a lounge as well as dedicated check-in and immigration facilities. There will also be easier access between the terminal and the aircraft. Said Seletar Airport general manager See Seng Wan: "We have made good progress with the redevelopment of Seletar Airport in recent years... We look forward to providing passengers with a new level of experience, in terms of comfort and convenience, when the terminal opens." The construction of the $50 million passenger facility is the next stage of Seletar Airport's renewal, which started in 2008 and has included lengthening the runway and building a new control tower. Aerospace giants like Rolls-Royce and Pratt & Whitney have, in recent years, built new facilities in the area, which is also home to pilot schools. The Seletar upgrade aims to establish Singapore, already a major hub for commercial carriers, as a centre for private jets as well. Ms Yvonne Chan, managing director of Seletar ground-handling firm Universal Aviation, said: "We welcome the improvements that have been made so far, and the future passenger terminal will also increase the attractiveness of Seletar Airport for business and commercial travellers." While a pleasant surrounding is nice to have, efficiency is key, said Mr John Riggir, vice-president and general manager of business aviation firm Jet Aviation. "Easy transition for our clients from airside to landside is essential and it's what business aviation operators look for. Our clients don't want to stay in the airport for long, so the key is to get in and out quickly and efficiently... The new terminal being built is a positive step in that direction."